We got so many inquiries relating to the Spätzle we made a week or so ago during our Hurricane Ernesto cooking day that we decided to do a video going thru the whole process, and also to show you how to make a traditional Oktoberfest variation on the dish, käsespätzle which is essentially the German take on Mac and Cheese. I can assure you that its totally worth making and it’s one of the best mac and cheese dishes you’ve ever head. Plus it goes really good with sausages and beer. Click on the “Read the rest of this entry” link below to see step by step instructions and photos. 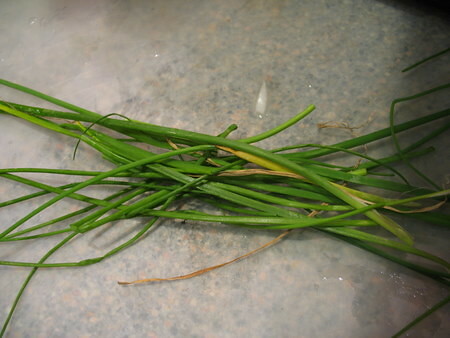 Finely chop up your chives. Grate your cheese. Here we’ve used Gouda, Parmigiano and also some domestic Brie which we have simply chopped up and mixed up with the rest of the cheese. 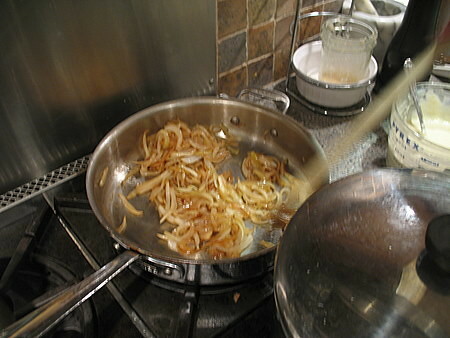 Thinly slice the onions and cook in fat (butter, olive oil, or even better rendered bacon grease or lard) on medium heat in a saute pan to caramelize. Stir together the flour and salt. 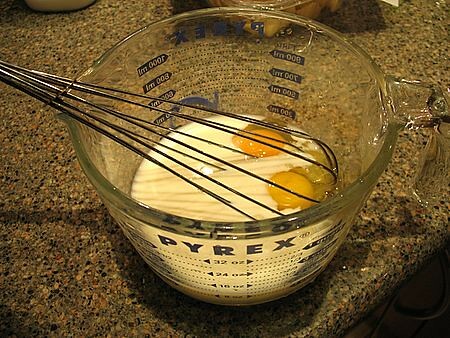 Combine eggs and milk; stir into the flour mixture. Pour the batter into your Spatzle press or Potato Ricer and place it on the lip of a large saucepan or pot (with a diameter of at least 20 cm or 8 in) of boiling, salted water. Turn push down the lever with one hand, keeping the press gently in place with the other. 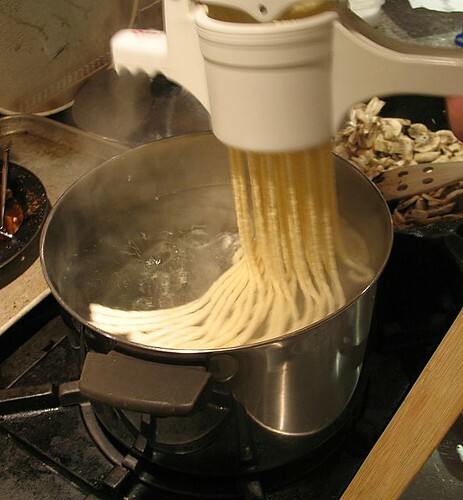 Take care to let the extruded pieces of dough (the Spätzle) fall into the slightly bubbling water and let them cook for approximately 2-3 minutes. 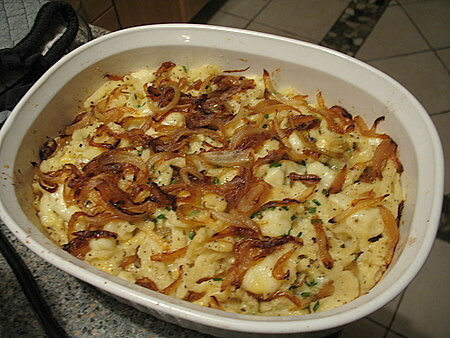 Generally, Spätzle swimming on the surface are sufficiently cooked and may be gathered with a large slotted spoon, drained and placed into a casserole dish. After removing each layer of noodles from the pot and into the casserole dish, layer a bit of the caramelized onions, cheese, chives and dust with salt and pepper. Repeat until you’ve cooked all the noodles and made multiple layers. Bake casserole at 350 degrees for 25 minutes. I know, its a English stout type beer and not a German lager or a Weissbier. But dark beer is perfectly acceptable with Oktoberfest food, and I didn’t have any German beer in-house. For those of you who think this plate of food is too beige, I will state for the record that Rachel cooked up some green beans, but I refused to photograph them on the grounds that the Germans would be perfectly happy with the above plate. This entry was posted on Tuesday, September 19th, 2006 at 10:29 am and is filed under Food, General, Links, Media, Recipe. You can follow any responses to this entry through the RSS 2.0 feed. You can leave a response, or trackback from your own site. But forget about the Lager. Germans nearly never ever drink that stuff, we just export it! We even call it Export instead of Lager. I agree with Kathi, and I also am German, the only thing I am curious about is mention of ” grated Quark Cheese “. 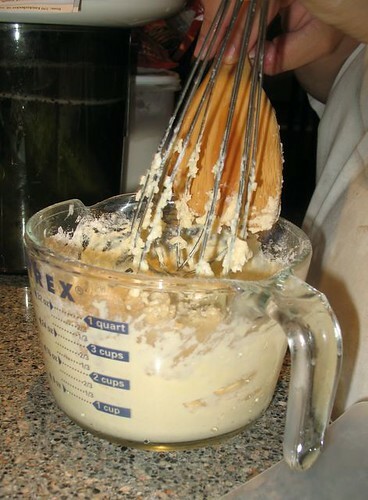 Quark can not be grated, as it is even more smooth then Ricotta and similar to Mascarpone. Even the term ‘Quark Cheese’ is a bit strange, as Quark is Quark and Cheese is Cheese, even though Quark is Cheese. Confused? Very few Artisinal US Creameries produce Quark, and their price is outragious. Quark is the very cheepest ‘Cheese’ one can buy in Germany. Quark is also excellent for “Cheese Cake”. Yeah, I just recently found out that Quartk is like a cottage cheese. I’ve seen Cheese Spaetzle recipes with Quark and others with grated cheeses, I guess it depends where in Germany you are from and who’s family makes it. not that yours is not good, it looks perfect, but if someone else want to make spaetzle and does not have the matrial. put your pasta on a cutting board, old it over the boilng water and use a knife tu push a small portion in the water. for sure, it is a bit longer to do, but you are sure, their form wil lbe tottaly irregular. My mother is from Augsburg Germany and she makes spaetzle for us (more so when she was younger, can’t stand on her feet any more so I make it) we eat it with either stew meat and gravey or meat balls in mustard sauce (latter soooo good), she used a large hole strainer to force her dough through. 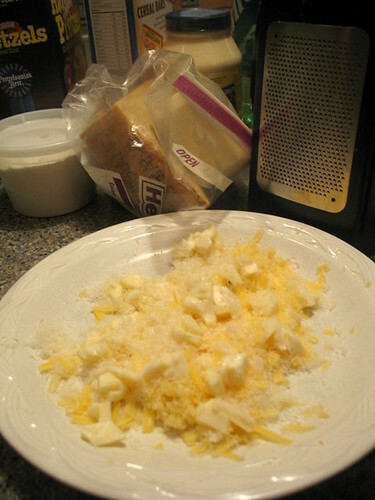 Then we take any left overs the next day and fry it in a lot of real butter and melt swiss cheese and stir it all up with salt and pepper, this is so good. I live in Mississippi gulf coast now and just can’t find a good swiss cheese down here like I did in Illinois. 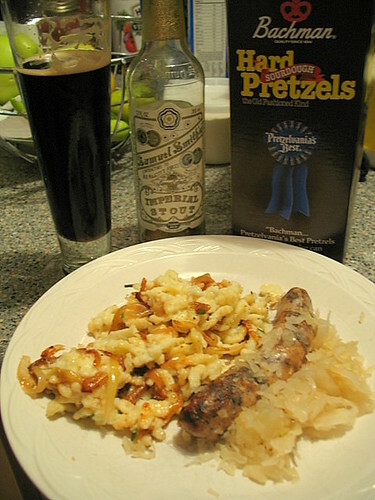 We lost our hublor in hurricane Katrina so we havn’t made any spaetzle in over a year. Sure miss it. Hi I am now back in Germany, but my children are still in the Us and love to eat spätzle. So I sent them this site so they can try to make them on their own. I enjoyed watching the demonstration on your Spaetzle. How far in advance can it be made? How well does it freeze? Not sure if you’re aware, but you’re missing a syllable. It’s KAZE-eh-Shpayt-zull … not KASE-Shpayt-zull. Not a big deal, but whatever. I’ve tried a few different recipes for this but it never turns out like a restaurant. It always seems like the restaurant fries it up a little after it’s done baking. 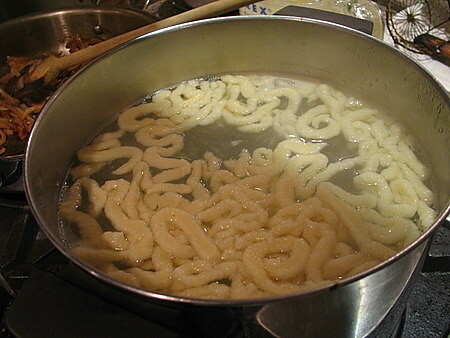 Some of the spätzle are actually browned on one side. Tastes amazing. Ever hear of frying it? Or maybe the browning happens in the oven? Thank you Scott. I was about to say the same thing. In Graz Austria I have had käsespätzle and it is the best. It doesn’t quite look like what you have done and I don’t have a recipe to go by. Does anyone know how it is done in Steirmark? Where I live in Germany some people pronounce it “kay-seh-shpet-sleh”. Has anyone else heard it like that? 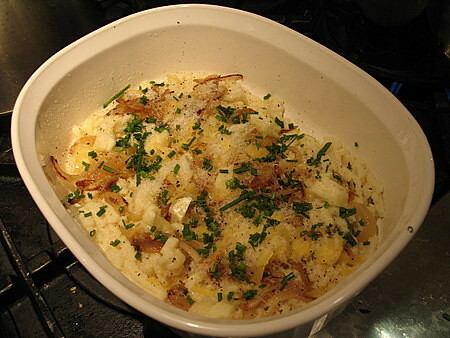 I also heard in some places in Austria they called it Kässspätzle, like KAZE-shpet-sleh. So I think it really depends on the region you are in! 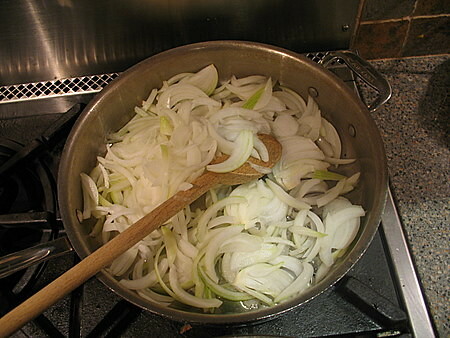 When I make Spätzle I cook them like you did in the pot, then throw them all in a big frying pan with onions and lots of emmentaler cheese and I fry it and fry it till it is crispy and starts sticking together. To trick people into thinking it is healthy I sometimes throw in some brocolli pieces or cauliflower and fry this with the cheese too, all mixed up like a German stirfry. THough I guess most germans might find the idea of putting vegies with their spaetzle sacriligeous! Vielen Dank for this video. I lived in Germany for 5 years in the Schwabian region (Stuttgart and Heilbronn) in high school. 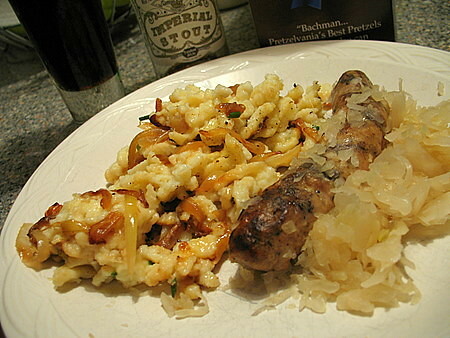 Oh how I LOVED spaetzle (in Schwabia they pronounce it as Natalie mentioned in her post. 23 years later I returned with my husband, 7 year old and 4 year old last Christmas because my brother in law was over there with the military. 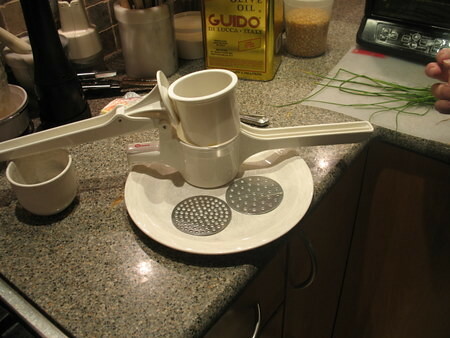 I asked my sister in law to send me a Spaetzle maker so that could make it at home….she finally did but I had no instructions and it was the SAME ONE YOU SHOW IN YOUR VIDEO—WHAT LUCK!. While I was there at Christmas, I bought a Schwabian cook book with pictures–in German, that I picked up last Christmas with recipes for Spaetzle but no pictures on how to use it. I attemped to make it today but I will have to keep practicing as my dough was VERY THICK. The recipe from the cookbook I have did not have me add milk, but rather WATER. I do appreciate this video so much! Also my sister in law sent me a package of Spaetlze Mehl (Flour), but said I could just use regular flour do you know what the difference is? I’ve been living in Germany for over 30 years and a LOVE Spätzle (which means “little sparrows”). All of the German Spätzle recipes I have ever seen have water, not milk. I think milk would tend to make spätzle a bit mushy. 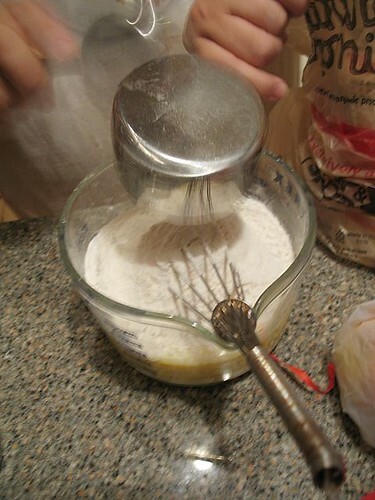 Joy of Cooking has you adding baking powder. That is WRONG, they get too puffy. In Germany, you can get special flour for spätzle. Some of the grains are a little coarser. You could try mixing regular flour with a little semolina. The point is that spätzle should have a rough surface. Your instructor is wrong. 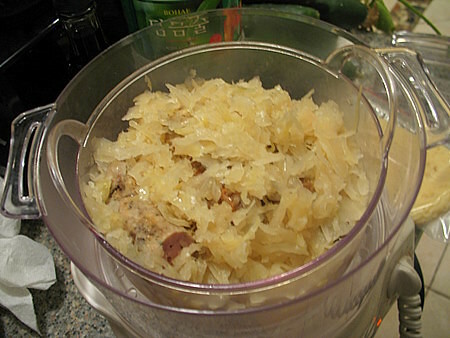 Sauerkraut is definitely eaten in Germany, but most commonly in BAVARIA where Oktoberfest originated. Great post – thanks for bringing this delicious and (I’m assuming) unheard-of dish over the ocean! Haven’t tried the recipe, but I’ll second Natalie’s pronunciation guide (I lived in south Germany for several years). Also, Sauerkraut is quite common in Germany, not that we needed to point that out. Makes me want to go and live in Germany once again. Looks delicious. I was just wondering whether it would go well with a glass of beer and noticed you had the same idea.